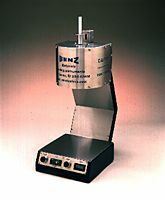 The Benz Melt Flow Index measures the rate of extrusion of molten resins, through a die of specified length and diameter, under prescribed conditions of temperature, load, and piston position in the barrel, as the timed measurement is being made. Melt Flow Index, per ASTM D-1238, measures flow rates of thermoplastics by extrusion plastometer. P.I.D. temperature controller, RTD temperature probe and cast heater insure rapid heatup and stable constant temperature to the test sample. Digital display of setpoint and actual temperature quickly provide correct temperature information. Thermo isolators separate electronic components from heat, providing more consistent test results and less potential for system failure. Metal surfaces are stainless steel or hardcoat aluminum, anodized for durability and ease of cleaning.